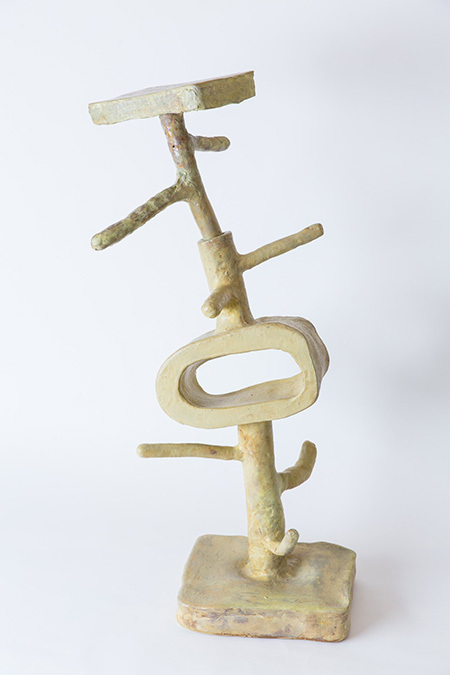 Woody DeOthello, "Cat Scratcher," 2017, ceramic, underglaze, glaze, 40 3/4 x 18 x 13 3/4"
This engagingly titled show, “Knocked-Kneed and Bow-Legged,” pairs Matt Kleberg’s paintings and Woody De Othello’s ceramic sculptures. Both examine the cultural moment’s unsettling instabilities — the gallery press release’s “curious alternate realities within unsettling social climates” — with beauty and humor. Kleberg’s large oil and paintstick canvases have the bright palette of 1960s hard-edge abstraction, but none of its dogmatic insistence on flatness, materiality and literal interpretation. Indeed, they play with the old metaphor of painted space as a virtual world framed by the painting’s edges, with their arched doorways, arcades, and doorlike niches, all walled up, so to speak, without exterior views. They are framed here and there by colored stripes and faux swatches of deckle-edged torn paper. Two of the paintings ("Sanctionary Sanctuary" and "Bike Sock Shock Jock") cheerfully take the isometric perspective used in architectural rendering and squeeze it almost flat. Notice also Kleberg’s humorous titles, including the likes of "Dancin’ Dave Dickel (Bad Hombre)" and "Fire and Brownstone." De Othello’s humanized, weirdly comical objects come from the Bay Area Funk tradition, think Robert Arneson, Robert Brady and Tom Rippon, among others. Five of these pieces rest atop ceramic footstools (or ceramic stands) with bendy, wobbly legs. In “Down" an orangeish tooth shape sprouts a stem, nose or spigot from its side. In "Wig Holder" a fish-mouthed vase, seemingly squeezed breathless, erupts with fingerlike protrusions; if your mind suggests less innocent protuberances, you didn’t hear it from me. "Cat Scratcher" is not so much a carpeted pet haven as a Surrealist tree for catching kitties.